Typical. Eidos Montreal open their window just a crack so they can shout to the streets the release date of the upcoming Thief , and what happens? Their Gamescom trailer leaps out into the public eye, to be snatched up by interested eyes. It continues the studio's insistence on promoting the game with CGI movies, but this time focuses on the city and it's increasingly harrowing problems. That release date then: the game is due to appear on 25th February 2014 in North America and 28th February 2014. 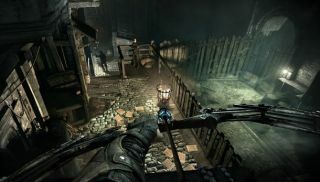 For more on Thief, check out Graham's hands-on impressions .